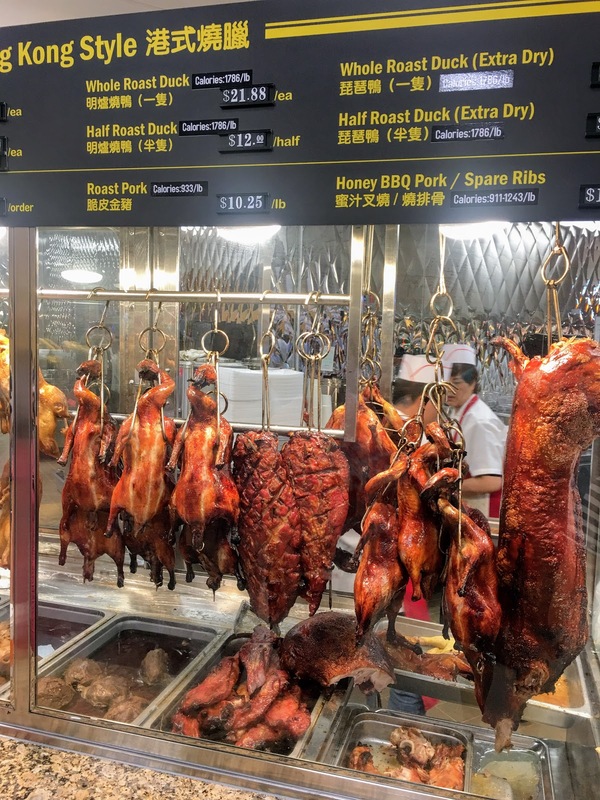 Duck Tongue, above, and Duck Feet and Pork Snout, below, are among the unusual items at 99 Ranch Market, a new Chinese supermarket in Hackensack's Home Depot Shopping Center. HACKENSACK, N.J. -- The expensive, edible bird nest in Chinese Bird's Nest Soup is made from the solidified saliva of cave-dwelling birds. Duck tongues and feet, pig snouts and brains, and snakes are other unusual items commonly used in the Chinese kitchen. 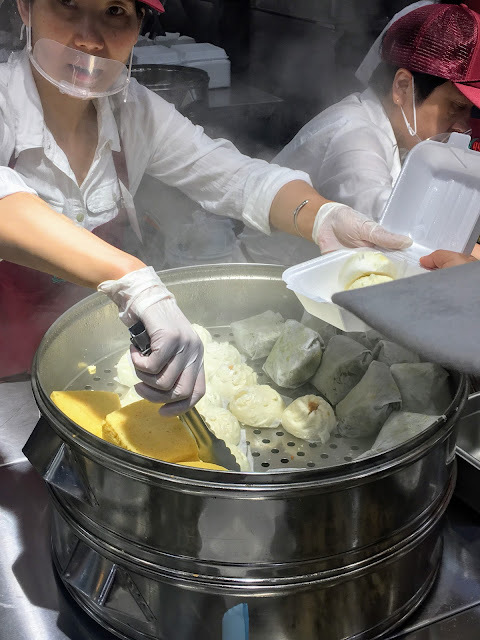 I've long heard the Chinese eat every part of the animal, and that was readily apparent on my first visit to 99 Ranch Market in the Home Depot Shopping Center on Saturday afternoon, though I didn't see any snakes for sale. The big, brightly lit Chinese supermarket, which opened on Wednesday, is the closest you can get to Chinatown without leaving New Jersey. And it's big news in Bergen County, where H Mart and other Korean supermarkets have dominated for decades. Chinese-Americans have had only King Fung Supermarket on Kinderkamack Road in River Edge in which to shop, but after two major renovations since 2009, that place is closed again. Cantonese-style dim sum are available in the food court, above and below. Two specialties from mainland China are Cold Jelly Noodles and Northern Fried Shredded Pancakes, above, and a Meat Wrap, below. Customers can use a large foam container to assemble a combination meal of Chinese favorites from this steam table for $8.99. Hong Kong-style Whole Roast Ducks, Roast Pork and Barbecued Spare Ribs. I saw Cantonese-style dim sum, specialties from mainland China, Thai and Malaysian food, and sweet buns and cakes, all available for takeout or dining in. There's more: Hong Kong-style whole roast ducks ($21.88 each), roast pork and barbecued pork spare ribs, which you see displayed in every Chinatown you've ever visited; and a steam table with Chinese favorites you can buy as a combination meal for $8.99. And another stand offers a rice porridge called congee with scallops, fish fillet, sliced pork, preserved egg or chicken ($6.50 to $7.25); and soups with shrimp wontons or noodles. The seafood department is a winner, offering live crawfish, crabs, lobster and fish, as well as plenty of fresh fish on ice. There is no charge to have the crustaceans steamed, but you can also ask to have live or fresh fish cleaned and fried "regular" or "crispy"
The supermarket also has a liquor license, though none of the bottles of sake and beer I saw can be sold on Sundays before noon. On Saturday, my wife spent some time in the store's boutique, testing Korean skin-care products. Fresh fish on ice included Shark ($2.99 a pound), above, and Strawberry Grouper ($7.99 a pound), below, which I've never seen in a fish market before. The eggs from wild-caught salmon were being offered for $49.99 a pound. I bought 2.2 pounds of live Crawfish for a boil ($4.99 a pound); trays of Fried Fish and Shrimp Balls from Taiwan for a noodle soup I'll make at home (about $10), and two whole Porgies, which I asked to have cleaned and fried crispy (about $5.50). For an appetizer, I picked up three kinds of shrimp dim sum, 9 pieces altogether (3 for $2.90). The Chinese market doesn't offer a discount card like ShopRite or a cash-rebate card like H Mart, but after spending more than $26 today on live or fresh seafood, I received a $1 coupon for the bakery or hot food. California-based 99 Ranch Market was established in 1984, and with more than 50 locations, claims to be "the largest Asian supermarket chain in the United States." But Han Ah Reum, which opened its first market in Queens in 1982, has more than 60 stores, including 6 H Marts in Bergen County. 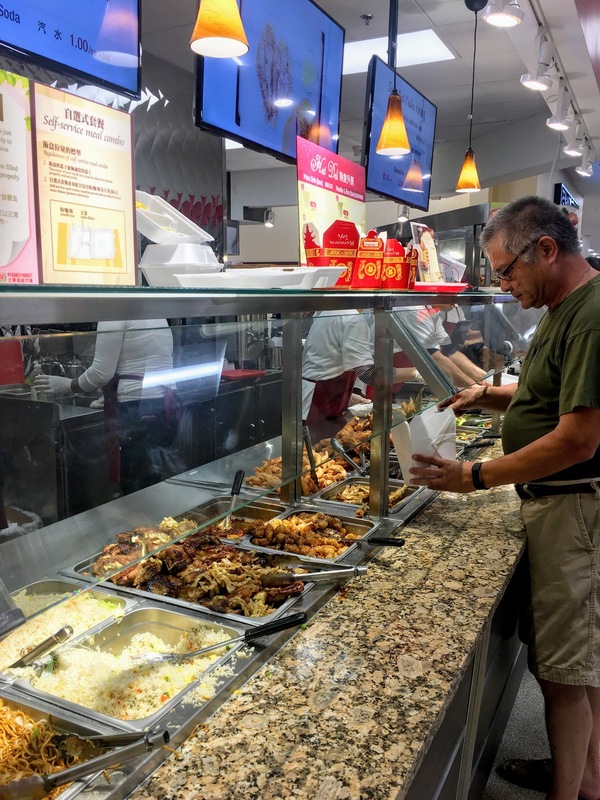 Han Ah Reum, now based in Lyndhurst, opened a new H Mart in Paramus in May, but unexpectedly closed the Englewood H Mart, shocking many hundreds of loyal Jamaican-American and other non-Korean residents who had shopped there since that supermarket opened in 1992. Although the many H Marts I've patronized have an edge on low prices, the new 99 Ranch Market in Hackensack is clearly a better Asian supermarket. The 59,170-square-foot Hackensack supermarket once was a Pathmark, but that store closed in 2011. Two more item in the meat case at 99 Ranch Market are Pork Tongue, and containers of Pork Brains, not shown. 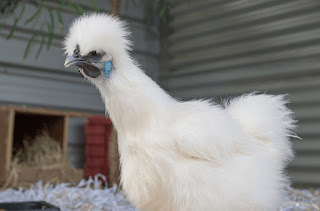 Silkie Chickens are a highly prized breed of chicken that has beautiful, silky white plumage and startlingly black skin, according to Kitchen.com. They are found in China, India and Southeast Asia. A Silkie Chicken (photo credit: The Happy Chicken Coop). Taiwan Spinach is one of three varieties of spinach I saw in the produce department. Unfortunately, 99 Ranch Market has only a small selection of organic produce. The store's coupon policy is explained in the vestibule.